The Scrum Cap is headgear used by rugby players to protect the ears and head when in the scrum. Wearing a Scrum Cap helps avoid getting ‘cauliflower ears’ – a condition that occurs when the ear suffers a blow, blood clot or collection of fluid under the perichondrium. 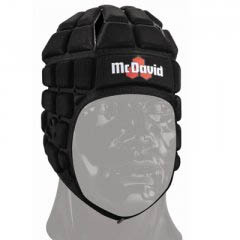 A alternative to a Scrum Cap is a thin strip of foam or cloth and electrical tape wrapped around the ears rather like a head band. The traditional Scrum Cap was made up of a thin cloth helmet with padding over the ears, held in place by a strap. Today, modern Scrum Caps are typically made from thin foam.